By "a significant part of the American public," he means "the part that said no to the KoolAid." Walton said in court Tuesday that he may demand a copy of the unredacted report so that he can determine whether the redactions were made properly. Someone please tell Trump that Walton was a Bush appointee. Somebody just needs to leak the full unredacted report, and then let Donnie, Barr and Ghoulie try to refute what's in it. The judge needs to bring in Mueller in to verify that full report is turned over. I fully expect Barr to leave out parts of it. This was a welcome development to read. The Judge has let the cat out of the bag: Barr is corrupt and is doing Trump's dirty work. That should not fly in a court of law. The Judge all but indicated that if the report looks like they emptied the permanent markers at Staples, it will be released (unredacted). It would set a nice precedent too for future cases: if there's a whiff of politics in a decision to hide something from the public, the rule will err on the side of disclosure absent the gov't demonstrating by a high standard that there's a compelling interest in redaction (e.g., nat sec, ongoing cases). "He added that Barr “has created an environment that has caused a significant part of the American public to be concerned” about the redactions he makes in the report set to be released Thursday morning,"
In this case, the theater is actually on fire, people are shouting fire and heading for the doors and Barr is ushering everyone back to their seats, telling them they are just smelling fresh popcorn at the concession stand. Barr didn't see this coming. Not exactly a flanking maneuver but requesting an unredacted copy to compare with Barr's Black Sharpie version sure mixes things up good. Can I say 'possible obstruction'? In 1989, Barr has already MISLED Congress in omitting parts of Justice Dep’t Memo using exactly the same phrase “summarizes the principal conclusions” as he did in his 3rd letter to Congress re:Mueller's Report! Barr has been doing VERBAL CONTORTIONS with his letters to Congress...1st letter was req'd, 2nd letter summarized Mueller’s Report with his own opinion/sound bites, 3rd letter says his 2nd letter was not a summary but a "summary of principal conclusions" in other words, a summary non-summary. Note: it's the same phrase used in 1989! Barr’s answered to Congressional hearing because it apes the VERBAL DIARRHEA of Individual1 i.e. “I think there was spying...but there was NO evidence". Now Barr is peddling spying hoax to Congress which is a sound bite for Individual1 to falsely trumpet/tweet! What happened to neutral, impartial, and independent USAG for the American People? 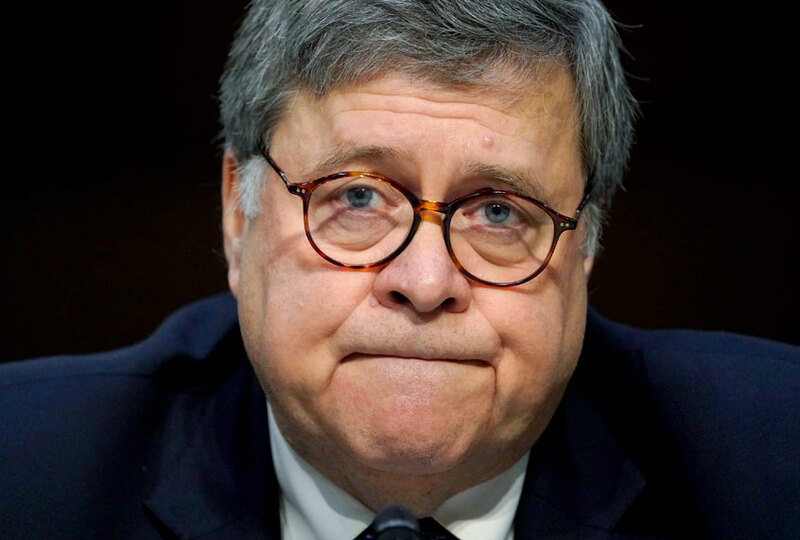 In few short weeks, Barr has forgotten that he is the USAG for the American People and NOT for Individual1. So if Barr is acting/performing as AG of Individual1... then Barr should have taken his son-in-law's job instead! Isn't that why Donnie appointed Barr--to sit on the part of that would show collusion or cover up? They're all well aware and the judge will be getting a phone call to find out his price soon enough....unless of course they have something on him, in which case why pay someone off if you can simply blackmail them instead? It will be fun to see what happens when a federal judge actually orders Barr to give her/him a copy of the unredacted report. Even better when she/he orders it released to Congress. And better still when she/he orders a version with minimal redactions (made by the judge with a little help from a non-partisan non-hack) be released to the public. The refusal to follow the order and the appeal on behalf of his client, Trump, will be amusing ... if not exasperating. True enough. This is not the first time Walton has thrown a spanner into Trump's works. Water seeks its own level . . .